Interested in learning about the dynamic start-up scene in the Triangle? Ready to discover the next Big Idea? Join us for an engaging, informal conversation at the American Underground campus in Durham, followed by food and drinks at Tyler's Tap Room. The American Underground is a thriving campus for entrepreneurs in downtown Durham, N.C.—a city that is capturing the national imagination with its Silicon Valley vibe and location just minutes from the world-famous Research Triangle Park. 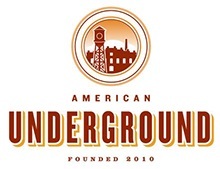 The American Underground was designated a Google Technology Hub in 2013, one of just seven in North America. In total, the American Underground is home to more than 120 startup companies across 60,000 square feet of space—two buildings in Durham and a new location in Raleigh. This success has garnered major national media coverage, including Time Magazine, Fast Company, U.S. News & World Report, The Atlantic Monthly and TechCrunch, and prompted a visit by the president’s jobs and competitiveness council. Adam Klein is Chief Strategist of the American Underground. Adam holds a master of regional planning from the University of North Carolina at Chapel Hill and an undergraduate degree from Denison University where he was a two-time academic all-american in golf. He and his wife Manda and daughter Gwyneth live in downtown Durham. John Austin is the Director of Groundwork Labs, a program to help selected entrepreneurs test and refine their ideas at no cost or loss of equity before they take their next step. Prior to Groundwork, John headed up Joystick Labs, an accelerator for video game studios, was CEO of Numerical Design Ltd., a software company acquired by Emergent Game Technologies, and Division, Inc., a virtual reality company that was acquired by HP. John earned a M.S in computer science from the University of North Carolina at Chapel Hill in 1984 and a B.S. in electrical engineering from Valparaiso University in 1977. Brian Dally is co-founder & CEO of GROUNDFLOOR, the nation's first crowdlending platform for real estate. Brian's 15 year career building disruptive technology startups spans stints in Silicon Valley, Boston, London and the Triangle. Previously, he led the launch of Republic Wireless to take on the big four cellphone carriers to international acclaim. As a result, millions more Americans can now afford a smartphone. Brian has a JD from Harvard Law School, an MBA from Harvard Business School, and a BA with Highest Distinction from the University of Virginia. Tickets: $10 for members, $20 for non-members. Click here to buy tickets!! !